If you played at all, you're probably getting some free stuff. Turns out all that Overwatching you were doing was part of a first season of competitive matches, and that season will end...on August 17, at exactly 5pm Pacific Time. Blizzard revealed as much yesterday, before announcing the date that Season 2 is scheduled to kick off: September 6. If you competed in season 1 at all, you've probably earned yourself some free stuff. For just completing your placement matches you'll get a "special spray and player icon", while if you managed to break into the top 500 players list at any point you'll also get an "extra player icon and animated spray". When the first season ends, your Skill Rating will be converted into Competitive Points. 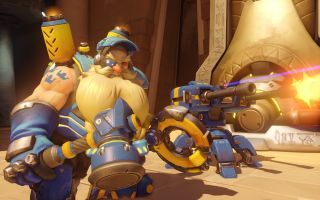 Players who managed to scrabble together a SR of 39 or under will be getting a handout of 10 CP, while those of 65 SR or over will be given 300 lovely CP to spend on golden weapon skins.